Our guide to Adhesives offers detailed descriptions of companies such as The Natural Abode and Abatron, Inc..
DAP is a leading producer of caulks, advesives, insulating form, spackling, glaze and other patch and repair products for homeowners and contractors. Abatron makes adhesives, sealants and coatings -- and is well-known for its epoxy compounds used to restore columns, windows, furniture, decks and millwork. Online merchant offers environmentally safe and friendly building products from major manufacturers, including wood, tile and cork flooring, paints and sealers, countertops, and products for heating and cooling. Focus is on indoor air quality. Eastern Marble & Granite Supply, Inc. 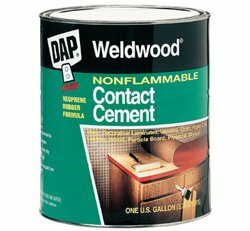 This water-based contact cement is nonflammable and low on odor, too.